Moscow will not allow a no-fly zone to be enforced over Syria, the Russian foreign ministry said on Monday. “Russia sees no necessity of introducing such measures and considers them counter-productive,” spokesman Alexander Lukashevich told reporters. He cited Libya as an example not to be repeated. The imposition of a no-fly zone in Libya in 2011 allowed NATO warplanes to help the rebels topple former leader Muammar Gaddafi. “We don’t want a repetition of that in the Syrian conflict and we will not let that scenario to be implemented in principle,” the spokesman said. “All these maneuvers about no-fly zones and humanitarian corridors are a direct consequence of a lack of respect for international law,” Lukashevich said. 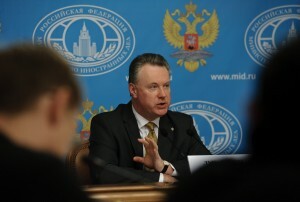 “I think we fundamentally will not allow this scenario,” Lukashevich told a news briefing. Lukashevich spoke before planned talks between President Vladimir Putin and US President Barack Obama on the sidelines of a G8 summit in Northern Ireland, which were expected to focus on the conflict in Syria that has killed at least 93,000 people. Russia and the United States are trying to bring representatives of Syrian President Bashar al-Assad and his foes to the negotiating table, but Moscow has criticised US plans to arm rebel forces and to consider imposing a no-fly zone. The West’s attempts to arm Syrian opposition would further delay the new Geneva conference, he warned. “The latest developments and steps undertaken to arm Syrian opposition which leads to serious escalation of the tension in Syria and around, make it even more difficult to speak about the timing (of the conference) than it was a month ago,” he said. The spokesman said the situation around Syria rapidly deteriorated, which hampered efforts to convene the conference in the nearest future. A Russia-US-UN tripartite meeting over the proposed international conference on Syria is scheduled on June 25 in Geneva.